Editor's Note: This review is written by Sean Chapman, co-host of The Weekly Stuff Podcast. While this week's episode is delayed - I'm currently out of commission with a nasty cold - Sean has put together this written review - spoiler-free! - of Uncharted 4, which we will talk about at length in our next episode. There is perhaps no game franchise in recent memory that is so beloved and yet so beleaguered by popular criticism than developer Naughty Dogs’ Uncharted series. While the sharp dialogue, cutting edge visual design, and groundbreaking performances have always cultivated a passionate audience, the unsettling juxtaposition of goofy one-liners and endless killing on the part of series protagonist Nathan Drake has made the franchise a particular black sheep among critics. It was in that environment that Naughty Dog made their previous game The Last of Us, which clearly took the cry of ludonarrative dissonance seriously by making the violence brutal and impactful for the main characters. Now, three years later, Naughty Dog has taken the lessons learned with The Last of Us and levied them at Uncharted with unusual effect. Uncharted 4: A Thief’s End is a fascinating game of self-criticism which takes Nathan Drake into an adventure far more quiet and intimate than its bombastic predecessors. And you know what? It might just be a damn masterpiece. While the intense in medias res opening - a la Uncharted 2 - sets up the player for a standard Uncharted action story, what immediately follows and actually dominates the majority of the game is quite different from the rapid platforming/cover shooting/ridiculous-set-piece pace that Uncharted is known for. Indeed, Uncharted 4 is a slow, quiet game that seems inspired far more by the 2013 indie darling Gone Home than the franchise’s usual fare like Indiana Jones. There are multiple sequences throughout the game which give the player free reign to simply explore large expansive environments and, more strikingly, intricately detailed homes without the pressure of fail-states or world ending doom. These sections leverage the incredible visual fidelity that Naughty Dog teases out of the Playstation 4 to remarkable effect. I was flabbergasted by an early sequence which gives the player as Drake the opportunity to wander through his house and just look at things. The interior design is so dense and convincingly rendered as a lived-in space that subtle character details about the differences between Nathan and his wife Elena can be deduced simply by the observable objects in the environment. That approach of intimacy over action is the overriding ethos for Uncharted 4, and the effect is incredible yet, for what is still technically an action game, occasionally bizarre. Don’t get me wrong, the third person cover shooting is here and better than ever. But, for a game that is about 14 hours long, twice as long as any of its predecessors, there really isn’t much of it. While I haven’t actually gone back and counted, I would not be surprised to learn that Uncharted 4 actually has the fewest combat sections of any Uncharted game. Which leaves me in a position I’ve honestly never been in while criticizing a game. I actually wish that Uncharted 4 had more combat sequences in it because the gameplay is just so goddamn good. The combat sections are designed more like arenas than the typical, straight-forward, corridor design that Uncharted has employed in the past. 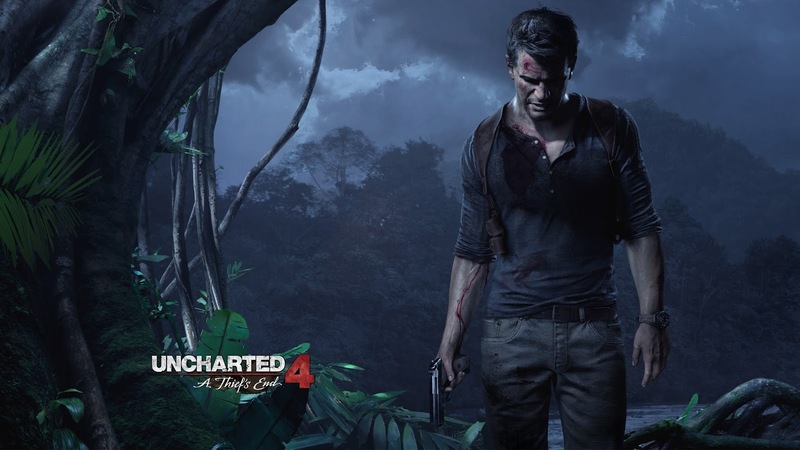 Nearly every encounter takes place in a wide open area, allowing the player to freely traverse the space by employing Uncharted 4’s largely expanded stealth and mobility mechanics to duck in and out of combat rapidly. The shooting is responsive and impactful, with the tremendous production design Naughty Dog is known for going to great effect making sure the combat always looks, animates, and sounds better than any other game currently on the market. There are moments of sheer euphoria when the combat just works. Like when a firefight suddenly breaks out of a botched stealth attempt and you rapidly shove an enemy over a cliff, then jump off that very same cliff to an equally similar demise only to grapple onto an overhanging branch at the last moment. You then swing forward, emptying your pistol into an enemy from behind. and at the apex of your swing you leap from the rope onto a third enemy, knocking him out and taking his gun in one smooth motion. Finally, you duck back into cover, reloading your newly pilfered AK-47 while you briefly catch your breath before more enemies bear down on you. These kinds of moments are the rule, not the exception and it is glorious to see Uncharted finally achieve the kind of swashbuckling gunplay it has always aspired to. It’s certainly ironic, however, that when they finally nailed it they barely take advantage of it. There are long, long stretches of the game, particularly in its first half, which feature no combat whatsoever. Some of that is more than welcome, but it is hard when you’ve played for hours with no combat at all not to occasionally feel that Naughty Dog took the usual game criticism of “too much combat” and overcorrected just a little bit. Likewise, the game offers very few of the insane action set-pieces the Uncharted series is known for. Outside of one major exception, which has been heavily featured in the marketing, there are only a couple of moments that provide that kind of spectacle and none of them rival the more ambitious sequences in Uncharted 3 in terms of scale. Again, that is certainly by design, as the slower pace and more intimate tone of the story naturally pulls the number and scale of such moments back, but it’s hard not to come away disappointed that you’re not armed with a series of jaw dropping sequences like “the boat” or “the mansion” in Uncharted 3 that everyone who played the game will recognize. Instead, Uncharted 4 turns that structure on its head by making the most memorable moments the small ones, as with the explorable homes and the tense character dynamics. In fact, the one truly bombastic set piece is immediately thematized as problematically representative of Nathan Drake’s dangerous lifestyle. The result is that Uncharted 4 is a game that has turned its predecessors’ weaknesses into its strengths, but occasionally the balance feels out of whack. Uncharted 4 seems hell bent on thematizing and incorporating the franchise’s criticisms into its design. Not only is the combat more open and stealth oriented, often allowing the player to avoid killing all together, but the environment design and climbing sections are also broadened out and opened up. In the past, Uncharted’s climbing sections were linear, with only one available path to traverse. 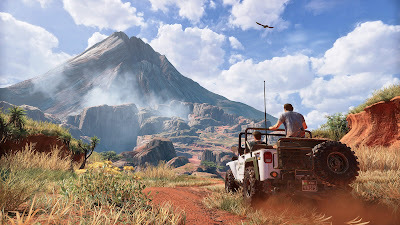 Uncharted 4 not only offers several large areas that can be explored at the player’s discretion, but the climbing sections more often than not offer multiple paths which lead to the player’s destination. It is a very small touch, but adding just a couple of handholds which move in divergent paths creates the sense of a more believable, less designed world. 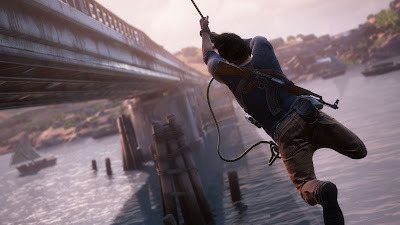 Instead of staring at the environment to discern the single line that takes the player to their goal, Uncharted 4 enables the player as Drake to simply start climbing and dynamically make choices of whether to, say, go left and swing or maybe go down and to the right through a window. All these choices lead to the same conclusion, but the choices existing in the first place create a more organic, subtle environment. The great advantage to Uncharted 4’s subtler approach throughout is that it enables some of the most nuanced and complex video game storytelling since, well, Naughty Dog’s last game. The constant restraint in regards to the action opens up the game to more opportunities for character dialogue and exposition which is often delivered effectively through the environment without dragging the player through piles of cut scenes. The treasure hunting plot, which explores a mystery involving the lost pirate city of Libertalia, is not only the best such plot of any Uncharted game, but for my money the best treasure hunting plot in the whole genre. The mystery at the heart of what happened to Henry Avery and his piratic cohorts is fascinating because it is given time to properly breathe and develop. It feels more like a slow detective mystery than the usual breathless exposition this genre typically offers as to why and how the main characters are chasing some lost, mystical city. The treasure hunt, which plays more or less as the game’s B plot, is deftly intertwined with the A plot involving Nathan’s long lost brother Sam and their history together. These two stories, along with a number of smaller subplots which pop up throughout the game, are all focused on the same core question: why exactly are all these people, Avery, Sam, Nathan, and the antagonist Rafe, so obsessed with going on these insane adventures after implausible treasure? The result is that Uncharted 4 is thematically self-critical. By attacking the fundamental motivation at the core of the genre as a real problem and not just pushing it aside as the main character being a scoundrel yet still a hero, it deconstructs the treasure hunt adventure genre of Uncharted, Indiana Jones, etc. and it does it well. Very well. As reductive as it is, it is hard to fight the urge to call Uncharted 4 “The Watchmen of adventure stories”, and while that places an unneeded burden on the game, Uncharted 4 does, to my mind, follow in that rare tradition of stories which successfully deconstruct their own genre. By leveraging the great performances and character writing that have always been at the heart of Uncharted with the more complex thematic storytelling of The Last of Us, Naughty Dog manage to create a story which definitively brings the Uncharted series to a close because it is the final thematic point these characters have to offer. Uncharted has always been a series about Nathan Drake getting out of the life, and only by peeling back the storytelling mechanisms of the genre and identifying their flaws can Naughty Dog truly do that. Uncharted 4: A Thief’s End is a masterclass in how to take the popular criticism of a game and use it to create a more complex sequel. Where the old Uncharted was breathless in its pace, A Thief’s End is gradual and deliberate. Where the old Uncharted was linear to a fault, A Thief’s End is guided but more open. Where the old Uncharted had trouble balancing the lighthearted adventure and the violence, A Thief’s End effectively thematizes the violence as symptomatic of a destructive lifestyle. A Thief’s End is so much of what the old Uncharted wasn’t, and yet I still find myself occasionally wishing that A Thief’s End, for all its complexity and moments of brilliant tranquility, had more of that simple earnestness that typified the old Uncharted. Then again, perhaps that is simply by design. After all, nothing makes one more nostalgic than the end of something great. The games actually track how many enemies you kill in a campaign so I can prove that Uncharted 4 has a drastically lower amount of gunplay than the original trilogy! It also statistically agrees with what you said about Uncharted 2 on the podcast the other week; that it was paced somewhat poorly towards the end with far too much combat. Wow, thanks for looking that up. I probably should have thought of those stat pages when writing the review. It's crazy to see just how diffuse the combat really is in Uncharted 4. It's significantly longer, yet has drastically fewer enemies. For a game with such polished combat mechanics, it blows my mind that you only fight an average of 37 enemies per hour!